This is a screen shot of the Apple’s Photos application in action. Although fairly basic in nature, it does have a few capable features. For the last 15 or so years, the main terminal for delivering photographs to our audience has been the computer and its accessories instead of their predecessors, enlargers and chemicals. 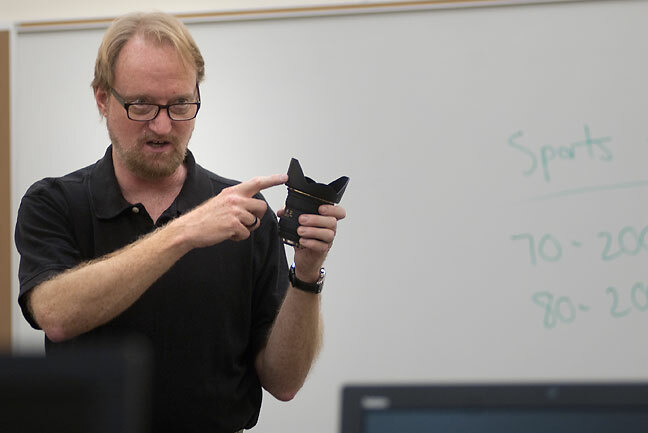 The interface between the photographer and the computer is software, computer programs that allow is to view, edit, and deliver images in the 21st century. Here is a rundown on some of the software with which I have become familiar. Adobe Photoshop: this is the ultimate in image editing, graphic design, and desktop publishing. It’s power to manipulate every element of an image makes it very attractive, particularly for artists and designers, but also for photographers who want control over every pixel. The down side is that it is expensive and complex, requiring a steeper learning curve than its contemporaries. There are a couple of features that make Photoshop my first choice. One is actions, which allows me to assign a function key to do groups of things to an image all at once; for example, I can create an action that will add yellow, darken the blacks, filter noise, apply the unsharp mask, and save the image, all at the touch of one key. Another is history, which allows me to got back through my edits one step at a time to see what I did and how it worked. Photoshop is integrated with Adobe Bridge, which acts as a kind of digital contact sheet and file manager. You can do some edits to one image, like noise reduction and white balance, then apply those edits to all the images in Bridge. My first experience with Photoshop was in 1998, when I was given a beige Apple G3 computer and Adobe Photoshop 5. There have been a long series of incremental upgrades to Photoshop, and it is now part of Creative Cloud. Adobe Photoshop is currently part of Adobe Creative Cloud, a marketing strategy that proposes to keep subscribers using the newest possible iteration of their software without having to go through versions. Adobe Photoshop’s little brother is Adobe Photoshop Elements, in version 14 and priced at $99 as I write this. In all honesty, unless you are a graphic artist or designer, Elements can do just about anything to an image you will need. For a lot of professional photographers, the biggest item Elements does not have is the ability to work with 16-bit files. There is a comprehensive list of the differences here, but in the end, for day-to-day photo editing, Elements is a powerful and impressive application. My friend Michael often uses Elements because it starts up faster. 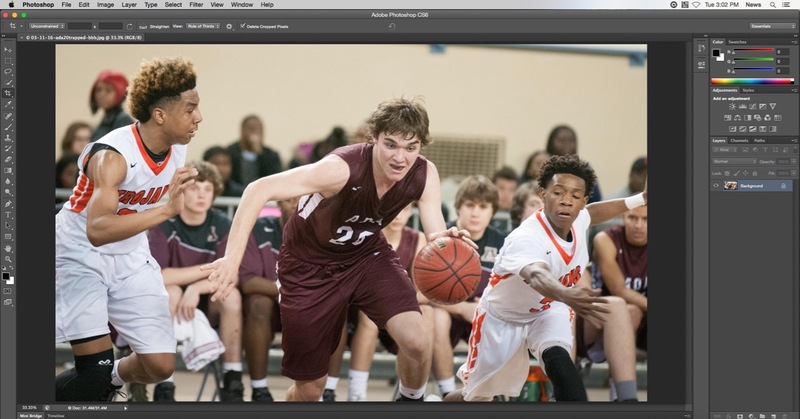 My class is photography, not software or editing, but I do touch on software, and the software I recommend for most of my students is Adobe Photoshop Elements. A pitfall of Photoshop is that it can, as I have discussed on a number of occasions, make pictures lie by adding or removing critical elements, over or under emphasizing elements of human features (from supermodels to war scenes to O. J. Simpson), and creating images that imply someone is saying or doing something they are not. Over the years, such editing has mislead readers and ended the careers of several leading photographers. Increasing in popularity in recent years is Abobe Lightroom. This combines some features of Photoshop with some features of Bridge, fusing them into a somewhat simplified interface. To me, Lightroom seems like Everyman’s Photoshop. While it has some powerful image management tools, I find its interface less intuitive than Photoshop. I actively dislike the way Lightroom pops hidden toolbars up when you mouse over them. One serious downside to Lightroom for me as a professional who needs to quickly edit images is the fact that you have to import images into Lightroom before you can work on them, then export them to a file to use them. The reason for this is that Lightroom keeps your edits in its database so they remain “non-destructive,” so you always keep your original photo, but that’s a little patronizing to those of us who figured out how to manage files and edit copies 16 years ago. 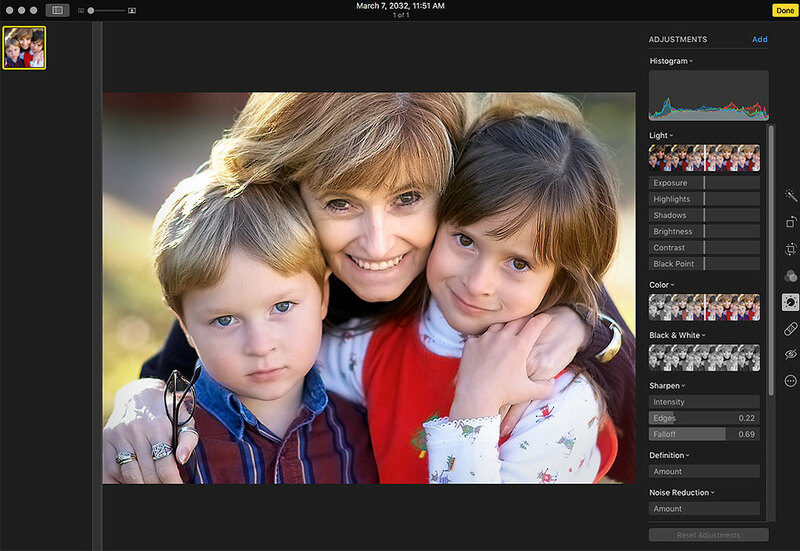 This is the Lightroom 6 interface. I’m getting more comfortable, and therefore better, with it since starting to use it last November, but given the choice, I’d still prefer Photoshop. Lightroom provides “Publish Services” like Behance, Facebook, and Flickr, with the option of adding more, it seems to me that over the years, applications that try to hold your hand are destined for the scrap heap. Social media integration is both ineffective and etherial, meaning that one day AOL is on top, the next day MySpace is on top, the day after that Facebook is on top, and so on. As I wrote this, I had no idea what “Behance” was, and going to its web site didn’t clear it up much. Essentially, I need to double-click a photo, smoothly and quickly edit it, save it, then send it where I need it, to a folder on a server usually. 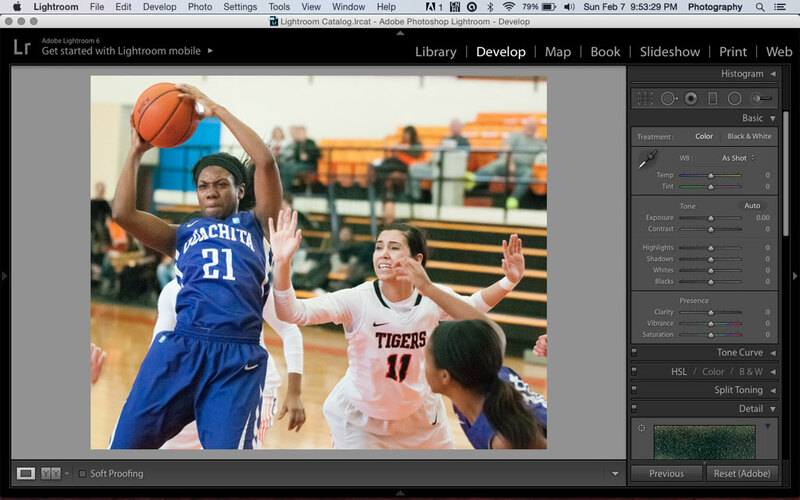 Lightroom fights me at every turn. Apple computer users, particularly those who use the iPhone and iPad products, are familiar with Apple’s Photos, which until recently was called iPhoto. Apple retired their fairly good Aperture application and merged it with iPhoto to create Photos with the goal of integrating desktop editing with phone and tablet editing. If Lightroom is an amateur product, Photos is the kid’s product. It has the few basic controls, but beyond that doesn’t have the tools, particularly brushes, that are critical for professional editing. Maybe in the end, the applications that try to do everything for you are for people who always struggled with that. That’s not me: my photos are organized by date, and indexed according to name and caption information, since we had to do this from the start of the digital age, long before Photos and Lightroom even existed, and this will probably be the only organization method that will stand the test of time. The reason for this is that software isn’t developed for your needs, but for the software company’s profits. If it doesn’t make money, it will disappear. Don’t believe me? Remember PictureProject? MyPictureTown? EasyShare? Microsoft Photo Editor? In conclusion, my first choice for photo editing is Adobe Photoshop, followed quite closely by Photoshop Elements. 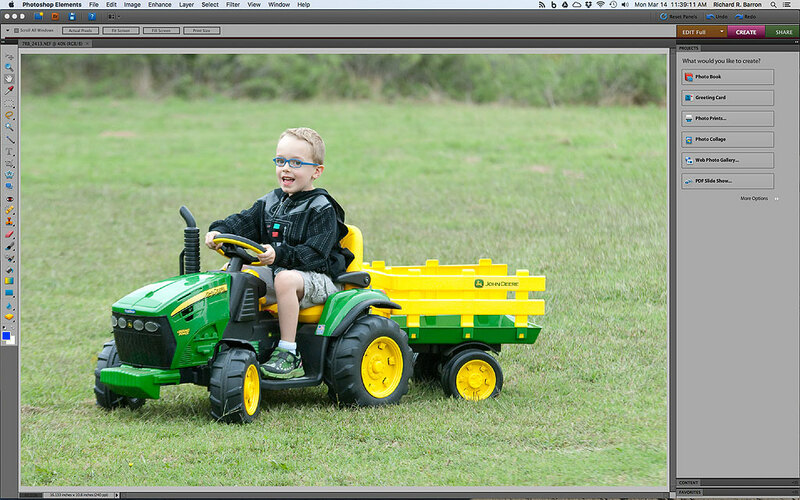 As you can see, the editing interface using Photoshop Elements is fairly comprehensive for day-to-day photography. This is version 10, but Elements is now for sale as version 14. While I haven’t used all the applications you have, and might have tried a few that you haven’t, I must agree with your conclusion. Photoshop is simply the only program that has *every* tool I need. However, I still haven’t tried the “cloud” version of it. I just can’t force myself to use bandwidth that way — it requires uploading any/every file you want to work with, and then downloading them again (assuming you want to save the edited copy, which I do). The old version I have (CS2) does what I need.